Hello Friends! Just checking in to tell you that yes, I'm still alive. I'm surviving quarantine mode. Although I wish my meals were better (and hot) and that the knitting was going right. I didn't get to do the Downton Abbey marathon like I had planned to do (faulty links and not a strong enough wifi signal), so instead I've been having movie marathons. I think I've watched every current horror movie to date and last night was a chick-flick-a-thon (Dirty Dancing, Center Stage, oh yeah baby!). I'm not getting as much knitting done as I thought I would, I've been getting bouts of major fatigue that's been making me take a lot of naps. Most likely from being off medication, but I'm definitely taking those naps simply because I can (and cause I need to). The fatigue is making my brain not function properly on a knitterly level cause on one of the projects I've been working on I've had to rip, re-knit, and rip again sooo many times. Honestly, I could have been done the project by now if I didn't have to rip it up so much! And it's such an easy pattern too! Ugh! So frustrating! I'm starting to think maybe I should knit on mindless projects for the remainder of my quarantine. My brain just simply doesn't want to focus on anything right now! I did manage to block a few projects and am surprised that they're already dry. It's amazing how much faster knitted items can dry when they're out in the open air and not shoved under a bed so that little toddler hands can't get to them during the day. Normally it takes a few days, even a week, for even the thinnest of knits to dry in my house. So yay for having at least two FOs to show you when I'm out of quarantine! I'm super smiley face about that! I also have to give myself major snaps for not going so completely stir crazy that I break down and go on a massive online shopping spree for yarn. And let me tell you, there were quite a few shop updates that happened over the weekend! Several times I had to ask myself "what would Natalie do? ", which would make me close the browser faster than you can say 'yarn sale'. I did have a moment of weakness and it took every fibre of my being to not give in and in the end I had to turn the computer off! Yes, thank you willpower for letting The Force be with me all weekend long! I did however, troll the webs for ball-winders. The day before my treatment I had wound a bunch of yarn and on the second skein it became quite evident that my ball-winder's days are very numbered. To the point where I fear the next skein will be its downfall. I'm contemplating purchasing another Knit Picks winder for now (it's what I currently have) since it's in the budget, and save up my pennies for this bad boy (which is definitely NOT in the budget). I've had my heart set on this winder for a while now and know that this one would probably be the last winder I would ever have to buy. Unless it had an unfortunate meeting with a hammer or something. All I know is that until I get my hands on it, I won't be winding up any hanks of Eco Wool or Wollmeise Laces any time soon! Ok, I'm going to go back to my knitting now. 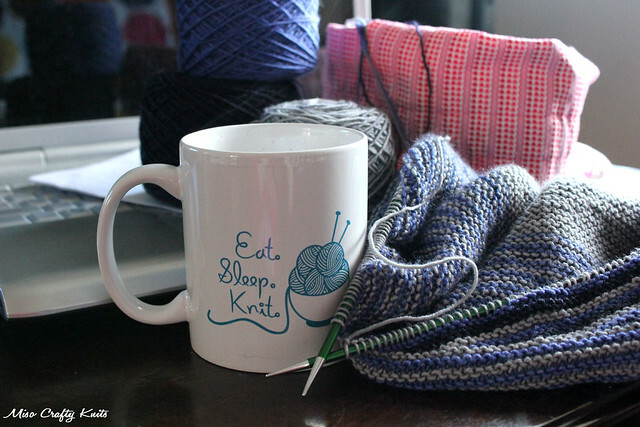 I need to take advantage of this uninterrupted knitting time while I can! I've got only one day left of my quarantine. You understand, right? So jealous you're getting time to nap and knit and watch tv....all interrupted and on your whim! Not so jealous that it's because you're not well. oh man, now that I've been named I better live up to the example!! glad you're getting some good naps in, sad the knitting's not totally working out as planned, hope quarantine will soon be over - we missed you at knitting on Friday! PS proud of you for not buying yarn! Sorry to hear your not feeling well but yay for two blocked fo's. Can't wait to see what you made. Get better soon!